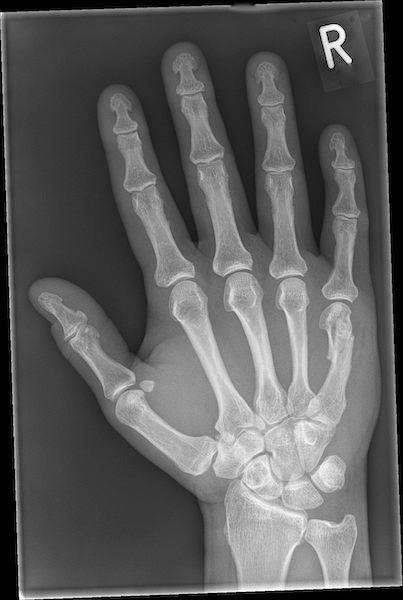 the xray doctor: xrayoftheweek 36: this is NOT a Boxer's fracture! xrayoftheweek 36: this is NOT a Boxer's fracture! The #xrayoftheweek is the subject of a poster I have co-authored with a colleague (and superstar GI radiologist in the making, James Stephenson), and is being displayed at the Royal College of Radiologists' Annual Scientific Meeting from Monday 7th to Wednesday 9th September 2015. 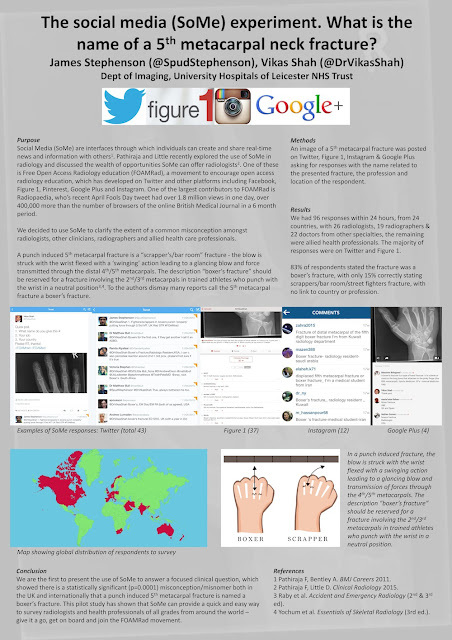 We conducted a survey using social media (SoMe; Instagram, Figure 1, Google+ and Twitter) to ask healthcare professionals what they called this fracture (other than a 5th metacarpal fracture), what their profession was, and where they were based. 96 responses within 24 hours, from 23 countries, with 26 radiologists, 19 radiographers & 22 doctors from other specialties, the remaining were allied health professionals. 83% of respondents stated the fracture was a boxer’s fracture, with only 15% correctly stating scrapper's/bar room/street fighter's fracture, with no link to country or profession. A punch induced 5th metacarpal fracture is a "scrapper’s/bar room" fracture - the blow is struck with the wrist flexed with a ‘swinging’ action leading to a glancing blow and force transmitted through the distal 4th and 5th metacarpals. The description "boxer’s fracture" should be reserved for a fracture involving the 2nd/3rd MC in trained athletes who punch with the wrist in a neutral position. We are the first to present the use of SoMe to answer a focused clinical question, which showed there is a statistically significant (p=0.0001) misconception/misnomer both in the UK and internationally that a punch induced 5th metacarpal fracture is named a boxer’s fracture. SoMe can provide a quick and easy way to survey radiologists and health professionals of all grades from around the world – give it a go, get on board and join the FOAMRad movement! You can download the full poster here, and don't forget to tweet us (@DrVikasShah and @SpudStepheson) with #RCRASM2015 with any comments!